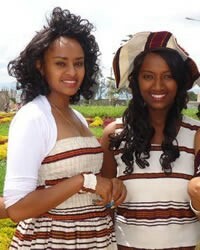 Overview: The Sidama people live in southwest Ethiopia, north of Lake Abaya. They are divided into numerous subgroups, typically based on location or religion, and they speak one of several Eastern Cushitic languages. About ten percent of the Sidama follow Islam. A majority maintain loyalty to their indigenous tribal religion or to various Christian sects. In recent years, the Wando Magano movement--a syncretistic fusion of Muslim, Christian, and animistic beliefs--has gained a strong following from among the peoples represented by the Sidama people cluster. -- James S. Olson, The Peoples of Africa. London: Greenwood Press (1996), pp. 502-503.